It's what the pros expect from an Ol' Man tree stand! Get on the hunt faster! 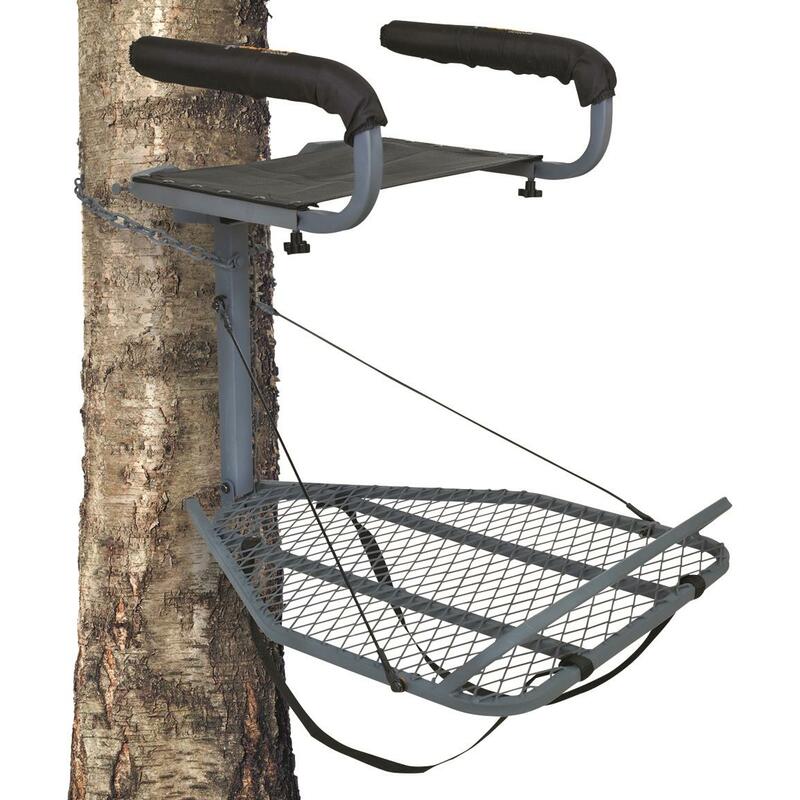 Based on the time-tested design of the original fixed-position tree stand, The Roost tree stand offers a whole lotta bang for your buck! Bow hunters especially appreciate how quickly this bad boy sets up, combined with the unmatched safety of the chain attachment. Backpack straps make it easy to carry your gear into the woods without making two trips, too! Platform Dimensions: 24"w. x 30"d.
Ol Man The Roost Hang - On Tree Stand is rated 4.3 out of 5 by 16. Rated 1 out of 5 by poolplayer 60 from cheap price- cheap product I just bought this tree stand,and just go it up when the cable that holds the platform broke. this is a piece of junk. You get what you pay for! Rated 5 out of 5 by John from Extremely comfortable stand that provides all day sits without discomfort. This is the second OL'MAN stand I have purchased and very pleased with their quality. Rated 5 out of 5 by Chet from I bought this thinking I would like the foot rest and seat style. Turns out, I love it. I was able to sit all day for several days in this stand. It is comfortable and it gives you plenty of room to move on the platform when needing to make adjustments when pulling back a bow. I found the footrest very nice on those long sits. The seat was quiet when pushing up when needing to stand. Very good stand. I plan on buying several more. Rated 4 out of 5 by Early Rider from Nice but! It's a very comfortable, quiet, well designed stand. The seat goes up quietly and there are no squeaks when shifting weight. The idea of having the arm rest slide off and change positions is good because it facilitates getting in and out of the stand without the raised armrest interfering . The armrest adds to the comfort, stability and safety of the stand. They are a great help when moving from a sitting to a standing position. In other words I really like being in the stand hunting.The only negative is its weight and bulk. With the footrest, the stand does not fold up tight. I like to keep stands folded, fasten them onto the tree, then open the stand for a tighter fit. The bottom grate and footrest kept falling into a horizontal position when I was trying to chain it onto the tree. I would advise anyone that buys one to get a short tight bungee cord to hold the bottom up vertical while hanging. It's not a stand for backpacking and moving around every time you go hunting. Once you hang it you'll want to leave it all year because of its weight. If they made the same stand out of aluminum, that might help.It has a great design but for over $100.00 it should be aluminum. Rated 4 out of 5 by Backwoods89 from Great price and well built Delivery was great and I like the stand so far! Waiting on hunting season to see what it is truly made of!